How to Catch iPhone Thief? Tii: Today in iOS 1.4 for Android. I have heard how everyone is having an easy time doing the new iPhone 4s/iPad 2 jailbreak, well mine wasn't so smooth. Long story short, if you have any VPN profiles on your device for work or whatever, this will cause the absinthe jailbreak to never complete. The absinthe jailbreak creates a VPN connection to finally install Cydia. If you have any other VPN profiles it doesn't make the correct connection for that final step, so at the very least add a line to your tutorial about removing any VPN profiles you have on your iPhone/iPad 2 when prepping for the jailbreak and things should go smoothly. It took me a whole day of trying to click the absinthe icon before I removed all my VPN profiles and the next attempt to jailbreak was smooth and successful. Thanks for the great podcast as always! 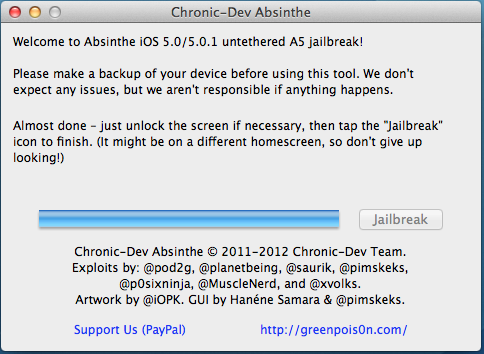 An un-tethered jailbreak is now available for iOS 5.0.1 for the iPhone 4S and iPad 2 - that is what this tutorial is for. Note: For the iPhone 3GS, 4 (GSM) and 4 (CDMA), iPad 1 and iPod Touch 3G & 4G - see this Tutorial. Step 0 - Before you start make sure you update your iOS device to iOS 5.0.1 if you have not done so already. If you do not know how to update your iOS device jailbreaking may not be for you. If you are already updated to iOS 5.0.1 make sure you do a sync and backup of your iOS device. If you have any photos or video you shot - transfer those now to your computer from your camera roll. Also force quit every open App on your iOS device and then go to settings and general and then go to Reset and select "Reset Network Settings". This will then reboot your iOS device. Next connect your iOS device via the USB cord directly to your computer - not through a USB hub or keyboard or Monitor - right to the computer. Step 2 - Download GreenPois0n from the links below and unzip the file. 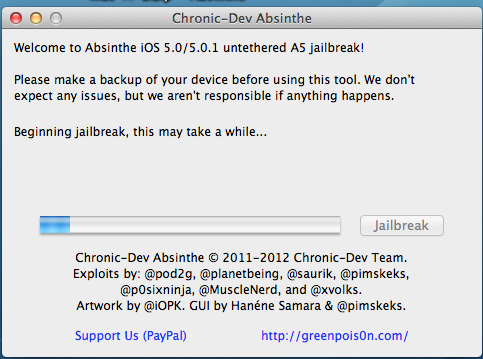 Step 4 - Launch - GreenPois0n Absinthe - and select "Jailbreak"
Step 5 - Sit and Wait. After you click Jailbreak above you will see some messages about the status of the jailbreak (see below). Step 6 - You will eventually (about 5 to 10 minutes - could be more or a little less) see the message below. You will need to unlock the screen and then find the icon on your iOS device that looks like the GreenPois0n skull and tap on it. Step 7 - You can then check your iOS device to find the Cydia App - which should be brown with a white circle and logo in the circle. If the Cydia app appears all white - this is not unusual. You likely will not be able to launch the cydia app if it is white. Simply power down (off) your iOS device and then start it back up (turn on). When it reboots - the Cydia app should now be brown. All iPod's Sold = 15.4 Mil Est = 9.56 Mil iPod Touches sold last quarter. Pretty much all Fortune 500 companies have deployed or are testing iPhone and iPad. $4 Bil will be earned by Devs by end of this month. Apple iTextbook event in NYC this month?